Jill Bradley is a twenty-four-year-old nurse whose life is going great; she has established herself in her new career and she’s looking forward to getting engaged to her high school sweetheart. But faced with a watershed moment, she has to deal with simultaneous family tragedy, injury, and betrayal, and feels it’s way too much to cope with. In a moment of despair, Jill books a trip to a Caribbean island in an effort to escape. While she finds respite and romance, her problems have also packed their own suitcase. Helen Bradley, Jill’s mother dedicated her entire life to her family like many mothers in the 1970’s and 80’s. Despite her best efforts, however, she hasn’t always been able to be the type of mother she wished she could be. She has a secret she was hoping would just go away, but it won’t. If she doesn’t share it with Jill it might bring her daughter more harm. My Review: Jill loves being a nurse more than anything .In fact, she's known for going the extra mile, sometimes breaking the rules to help a patient in need. An accident causes Jill (and hospital administrators) to doubt her judgement. She loses her fiance, her apartment, and her independence within a matter of days. How will she be able to cope with her mother's illness and the secrets that have been kept from her? I connected with this book on the very first page. I love the author's voice and her captivating way of weaving a tale. The story explores both Jill's and her mother's (Helen) point of view. The story moves back and forth in time, gradually revealing secrets that explain why Jill is the way she is. There are other secrets too--it seems Jill is the only person who is unaware of a tremendous betrayal. This book had a very natural flow that swept me along and pulled me in. I found myself crying in more than one spot, as I had enormous sympathy for both Jill and Helen. 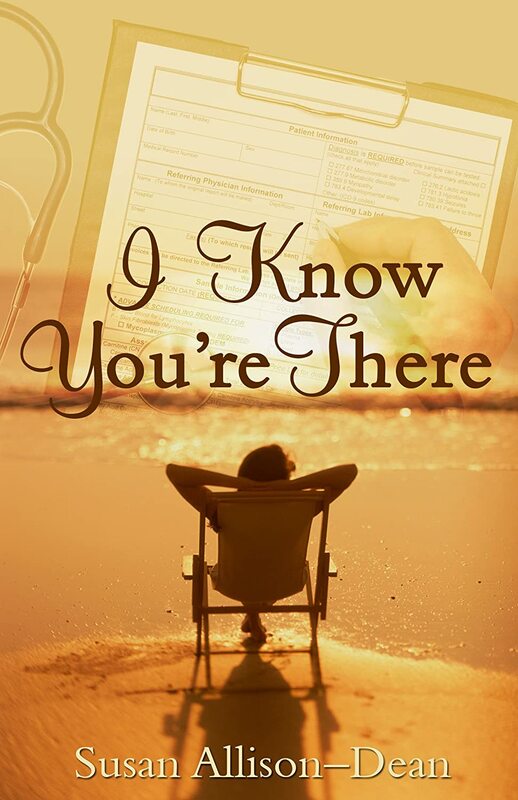 I Know You're There explores themes such as guilt, betrayal, loss, tragedy, healing, and love. I ended up giving this book 4.5 out of 5 stars because editing could have been better. Overall, I would definitely recommend this book to anyone who loves Women's Fiction. Sue Allison-Dean is a nurse who retired from traditional practice in 1999, after working 13 years as a Wound, Ostomy, Continence Clinical Nurse Specialist. She found a second career in gardening after working in a garden center and completing an organic gardening internship at Highgrove Garden in England. She now co-owns Naturescapes with her landscape designer husband, Robert. She has authored several clinical and horticulture articles and was a contributing author to the bestselling book, Touched By A Nurse. She is passionate about the sea and loves exploring tropical islands. She extends this passion by doing volunteer work benefitting dolphins and whales. Sue splits her time between Armonk, New York and Cary, North Carolina, with her husband and English bulldog, Bubba.